I just got into a car accident. How much will I receive for my bodily injury claim? After you’ve been involved in a car accident, it is important that you handle your case correctly from the very beginning. There are a variety of different missteps that you could make that could ruin and/or destroy your case. It is important to keep in mind that if you do not have an attorney, you will be the only person advocating for you. Neither the other party’s insurance carrier, nor your own insurance carrier is on your side. Both insurance carriers will try to minimize the value of your case or destroy your case altogether. The insurance company will try to hurt your case by either denying liability, minimizing or rejecting your damages, refusing to provide coverage, or all three. This is why it is important to make sure that you have someone on your side that will advocate for you and your case. Insurance adjusters are hired by the insurance company to save them money. The insurance adjusters job is to pay you as little as possible or reject your claim entirely. When dealing with the insurance adjuster on your own, remember that the insurance adjuster handles claims all day long and knows how to reduce the value of your claim or deny it entirely. 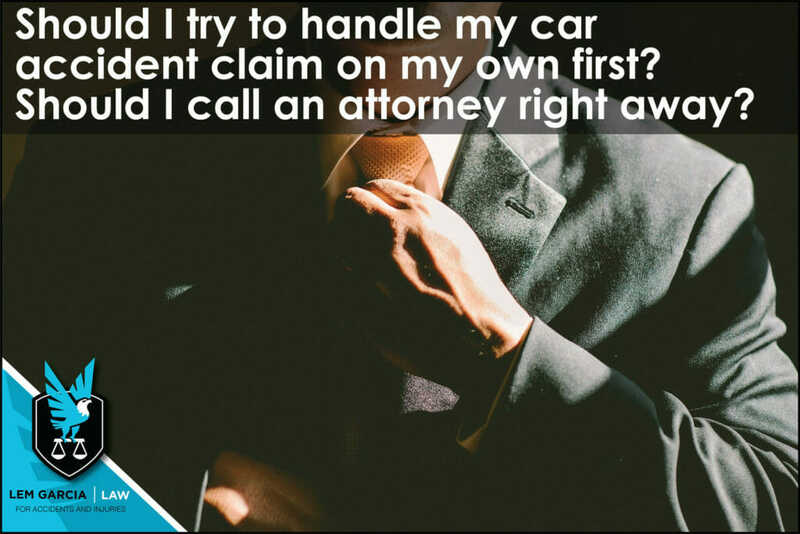 You can attempt to handle the claim on your own, but the odds are very high that you will make a mistake and it may hurt your case. Most personal injury attorneys provide free consultations to people who have been injured in a car accident. If you find an attorney that provides free consultations, you have absolutely nothing to lose by making an appointment and discussing your case with an attorney. West Covina car accident lawyer, Lem Garcia, provides free case strategy sessions without any obligation to you. We want to make sure that you know your rights and that you do not get taken advantage of by the insurance company. You are already in a difficult situation because you were involved in a car accident, and we are here to help make sure that a difficult situation does not get worse. Call us today for your free case consultation. We are happy to help you.